A big and healthy frog is desirable, but why? What is hiding above it and what makes it so important? This nice specimen of a big frog on this Irish Cobb stands in stark contrast to the narrow and underdeveloped frog below. The caudal or plantar foot (back half) is designed to not only support the weight of the horse and distribute it within the foot, but also absorb the landing force of the moving horse which can be 10 greater than the mere weight of the animal. To understand the importance of form and function of the frog, let’s have a look inside the hoof capsule, more specific, the inside just above the frog. Rear view of the interior of the horse hoof (From the Glass Horse). The collateral cartilages are composed of hyaline cartilage with vascular channels inside for energy dissipation, while the digital cushion consists mostly of fibrocartilage. With continuous stimulation (through the frog’s ground contact) and exercise, these tissues will adapt and become bigger and thicker, as more collagen is deposited within them, thus developing a fibrocartilaginous tissue of glycoproteins and proteoglycans. In strong hooves, the thickness of the lateral cartilage is up to 1/3 of the width of the hoof, in weaker hooves a lot less. So by palpating the lateral cartilage, one can determine if a hoof is strong or weak, fully developed or pathologically atrophied. Furthermore, the collateral cartilages themselves should be connected with each other by a strong floor upon which the digital cushion sits. The stronger and thicker this floor becomes, the more it can protect the navicular bone and its two ligaments which connect it to the third and second phalanx. 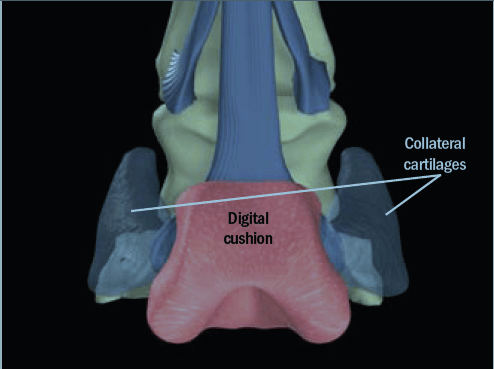 So we can see a direct correlation between the navicular syndrome and a thin and underdeveloped collateral cartilage. 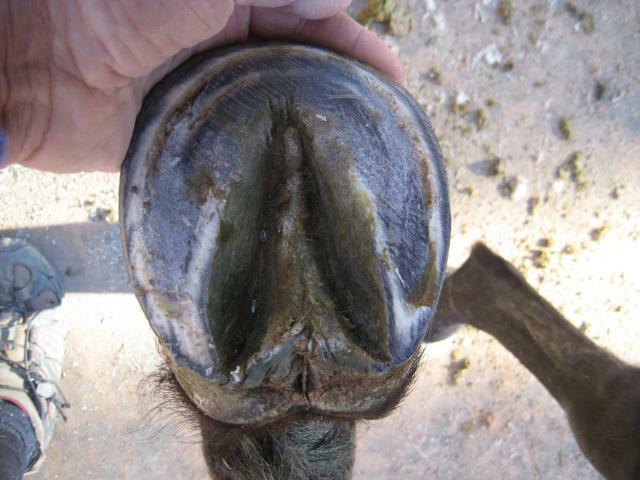 The images below of a cut section through the hoof just above the frog, parallel to the ground reveal the difference between thin and thick cartilages clearly. Above photos and script courtesy of Dr. Robert Bowker (Bowker files). 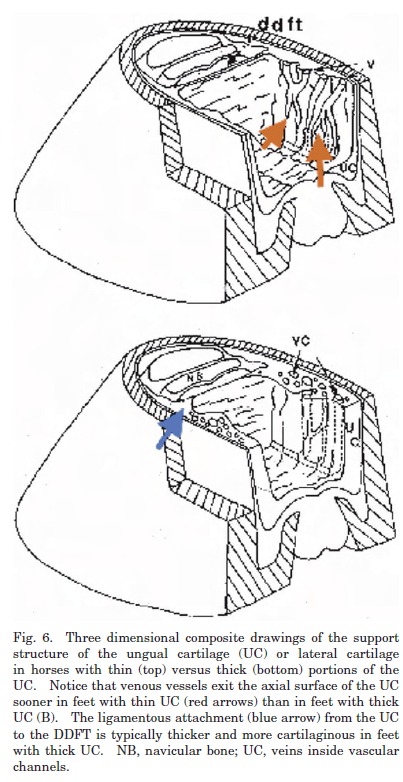 A schematic three dimensional drawing of a strong foot vs a weak (underdeveloped) foot helps visualizing the interior of the hoof capsule. Drawing by Dr. Robert Bowker (Bowker files). 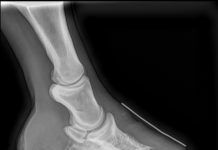 X-rays do not show the non bony interior of the hoof capsule very well. 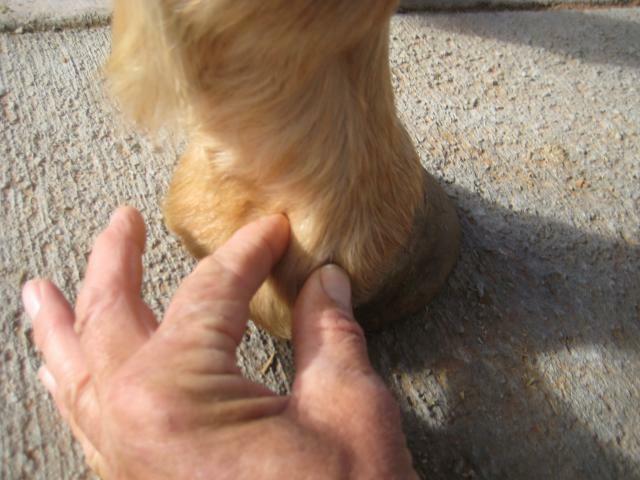 So how can we simply and easily determine, by observation and palpation, what kind of hoof we are dealing with? First we can observe and feel the lateral cartilage with our fingers. 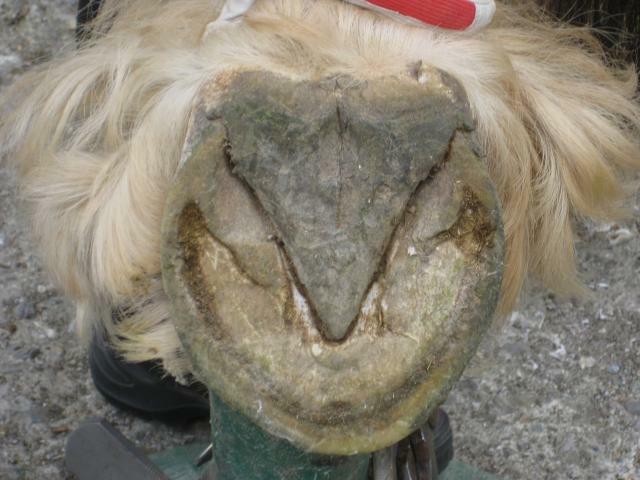 There is large and well developed lateral cartilage on this hoof. It feels firm and thick, not mushy. 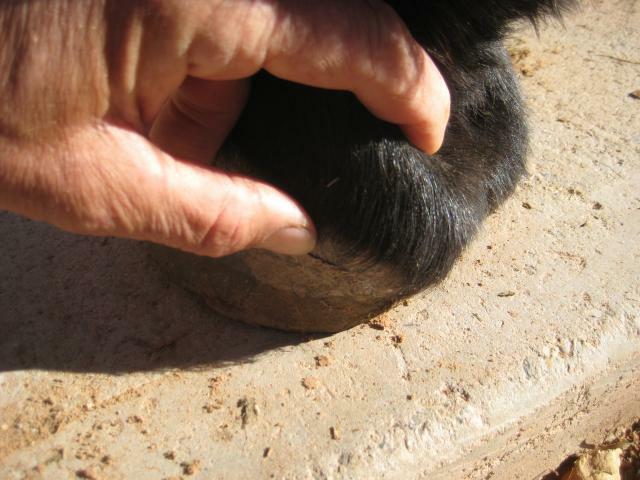 Compare the above photo to this underdeveloped hoof of a 4-year-old mare with a small and thin lateral cartilage. Next we compare the length of the collateral cartilage to the length of the coffin bone. In a strong hoof, the cartilage should be longer than the coffin bone. 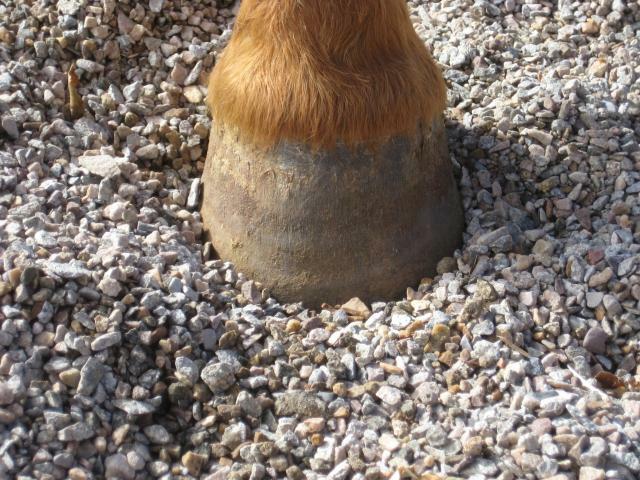 Judge for yourself in the foto below how this hoof stacks up. Red line indicates the length of the cartilage, green arrow the approximate length of the coffin bone. Next, we feel for the thickness and denseness of the digital cushion. 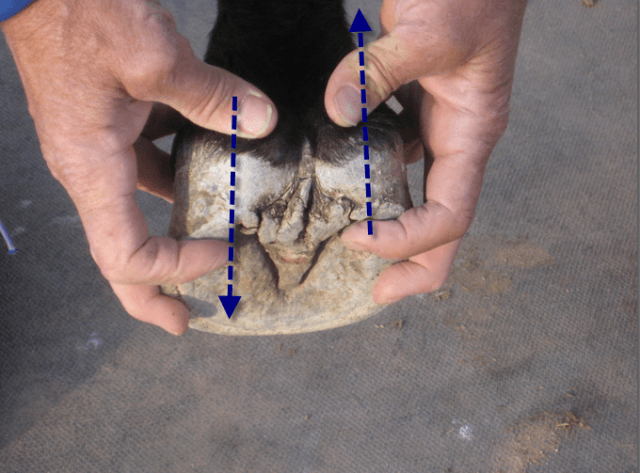 Medium density and thickness is observed in this hoof. 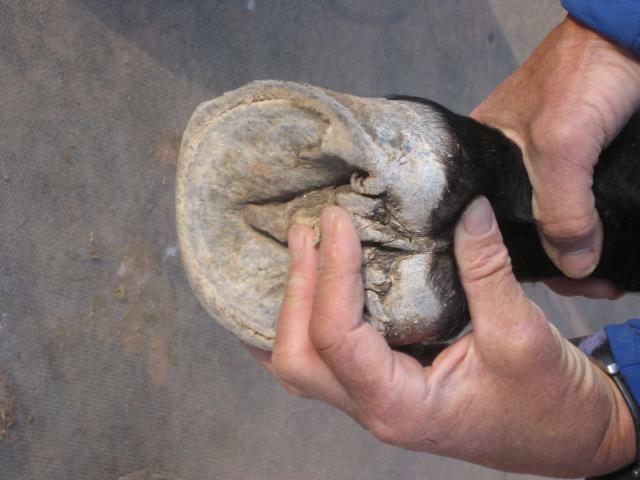 Compare again to the underdeveloped hoof of the 4-year-old mare. The digital cushion feels soft and mushy. The digital cushion is also very thin. Observe how easily my thumb can press into it. This foot lacks sufficient structure in supporting the forces and loads when traveling and standing. Next we check for the strength of the connectivity (the floor) between both lateral cartilages. For this test, we place thumbs of both hands on the heel bulbs and index fingers on the heel. Then we try to move the medial and lateral heel sections in opposite directions. We want to feel and observe very little, if any, movement whatsoever, an indication of a well developed and thick connection (floor) and corium. Both heel halves should feel solidly and firmly connected. Best is if no movement is felt. Blue arrows indicate direction of push. 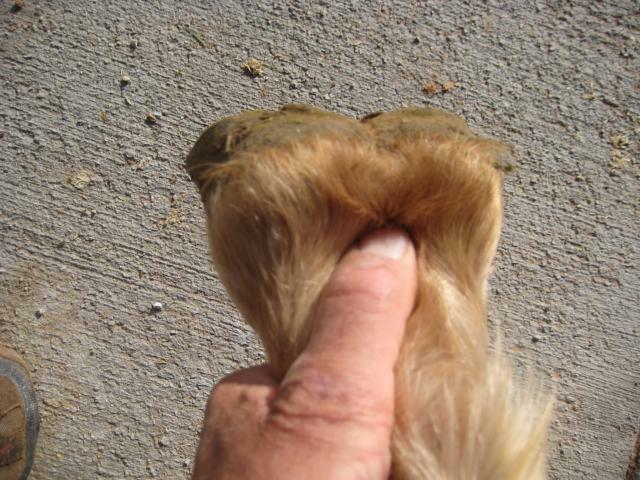 Natural Hoof Trimming considerations: It is advisable to refrain from any frog trimming (There are exceptions). Professor Robert Bowker found in his research that the front 1/3 of the frog is activating fibrocytes to produce this important fibrocartilage in these ligaments. This fibrocartilage is essential for strength, protection and shock absorption as well as shock dissipation. He calls it the ‘swollen’ part of the frog, which begins about 1 cm behind the apex. 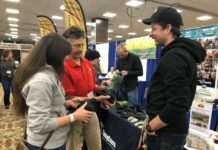 He also believes that the foot should get more centrally loaded by carrying about 80% of the load, while the actual hoof wall should carry only about 20%. Trimming should reflect this percentage. We can determine the probability of long term soundness in large part by evaluating the digital cushion and collateral ligaments. 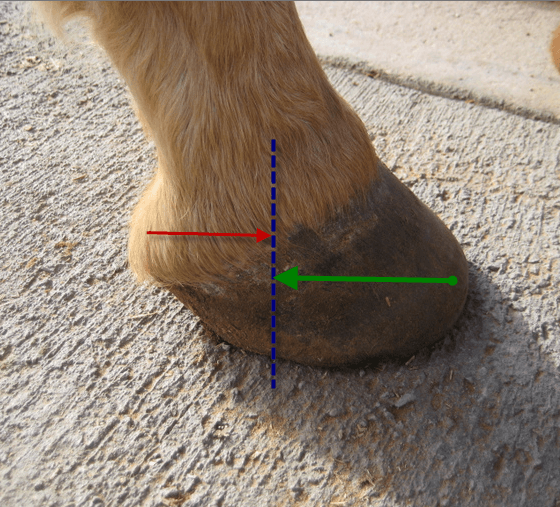 A young untrained horse (3-5 years) with underdeveloped caudal foot needs to be judged differently than an older one displaying the same weakness. 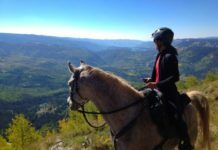 The younger horse has a lot of potential to develop a robust caudal foot, while there might be inherently less of a chance with an older horse that does not sport a thick and large collateral ligament and digital cushion. 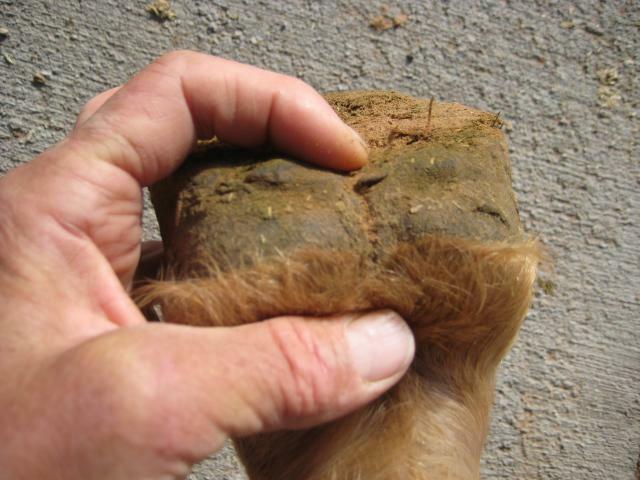 Exercise, palmar hoof and sole stimulation, and proper diet are essential for hoof development. It will be interesting to see how the hoof of that 4 year old will look in 2 years from now. For hoof stimulation, best surface is still pea gravel. 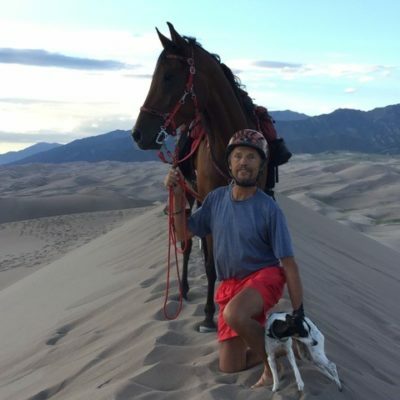 When placed in areas the horses like to hang out the most, for example at their feeding places, the constant stimulation will not only toughen the sole and frog, but greatly help develop this important fibrocartilage in the palmar foot.